Blade Runner might not seem like the first movie that you think of kidsy, cute merchandising opportunities, but this Police Spinner is just goddamn loveable. It's even got a 'Pull Back and Go!' feature! 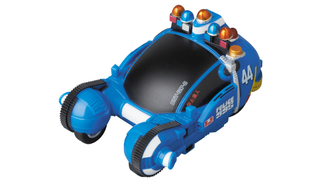 The cutest police vehicle in sci-fi comes from Medicom, and is part of a new release of the movie's Final Cut in Japan next month. It's only a teeny thing at 7cm long thanks to the super deformed style, but my god it's so cute! Just what you want for your noirish dystopian future, right? The Blu-ray it comes with is pretty swanky, complete with art cards and a fancy steelbook, but the highlight is definitely the Police Spinner. Just looking at it I want to zoom it across my desk. The edition is sadly exclusive to Japan, where it's out December 17th for just shy of 6,000 yen (roughly $50).